Buried treasure is one of those things that sounds like it only exists in stories. But throughout history, valuable objects—coins, jewelry, crowns—have often been either deliberately buried or just lost to the ages. Here are seven of the most valuable and extensive treasure troves ever brought to light. While repairing the embankment of the River Ribble in Cuerdale, near Preston in England, a group of workmen dug up a lead box. Inside was one of the biggest hoards of Viking treasure ever found—more than 8600 items were documented, including silver coins, various bits of jewelry, and silver ingots. Although the majority of the items originated in English Viking kingdoms, some of the treasure was also traced back to other regions, including Scandinavia, Italy, and Byzantium. The treasure was presented to Queen Victoria, and some of it is now on display in the British Museum (as seen above). The workmen who found it, meanwhile, managed to grab a coin each. Having lost his hammer in a field, farmer Peter Whatling called a friend with a metal detector to help him find it. Instead, he found treasure. Inside the oak chest was a collection of silver spoons, gold jewelry, and coins, all dating back to the 4th or 5th century CE. Whatling called in help, and archaeologists managed to find all sorts of other treasures buried in the same field, including Roman ladles and serving bowls. The hoard was bought by the British Museum, though it was so valuable the museum had to call in funds from donors like the National Art Collections fund to afford it. As for the errant hammer? That’s now in the British Museum, too. Terry Herbert was using his metal detector on a recently plowed field near Hammerwich in Staffordshire, when he stumbled across the largest trove of Anglo-Saxon treasure ever found. All told, the hoard included over 3500 items, most of which were military-related. As well as weaponry, though, the hoard included several religious artifacts, and lots of decorative items. It’s tough to be exact, but the hoard is thought to date back to the 8th century, and has influenced the way historians think about that period in English history. Enough to make you rush out to buy a metal detector, isn’t it? Back in 1985, an old building in the Polish town of Środa Śląska was being demolished ahead of renovation works when a vase was found beneath the foundation. Inside were more than 3000 silver coins, dating back to the 14th century. A couple of years later, when another building nearby was knocked down, even more artifacts were uncovered, including lots more gold and silver coins and an array of jewelry, including a gold crown and a ring bearing the head of a dragon. 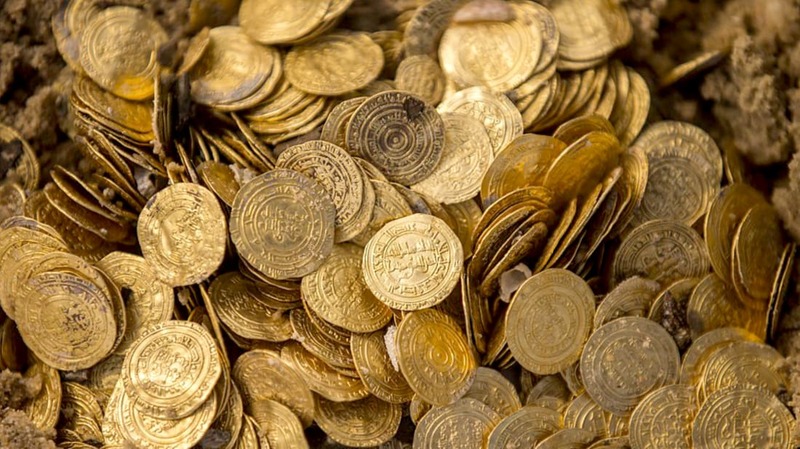 Although there’s clearly a lot of treasure there, experts have struggled to put an exact value on it, because nothing else quite like it really exists. Scuba divers exploring the seabed near the harbor of Caesarea National Park, Israel, thought they’d stumbled across a child’s toy when they found the first gold coin. But when they saw how many coins there were, and looked more closely at the engravings on them, they realized they’d found something pretty significant. And so far, no one’s attached an exact value on the find, except to say that it’s so valuable, it’s essentially priceless. Brothers Pavel, Petko, and Michail Deikov were digging for clay at a tile factory near Panagyurishte, Bulgaria, when one of them stumbled across what he thought was a strange whistle. Further digging uncovered more objects, and when the brothers took their finds to the mayor’s office, they found that they were made of gold—and there were a lot more where they came from. Actually, rather than being a whistle, the first thing they’d found turned out to be a ceremonial drinking horn, dating from the 4th century BCE. There were also golden decanters, a kind of dish, and a vase, all of which were thought to have been used in religious rites. All in all, they found more than 13 pounds of solid gold carved into elaborate shapes and intricately decorated. The treasure found at Tillya Tepe, which has become known as the Bactrian gold, was recovered from six burial mounds. More than 20,000 gold ornaments were retrieved. The treasure was dated between the 1st century BCE and the 1st century CE, and came from the burial sites of a nomadic prince and five women (possibly his wives). What’s particularly interesting about this hoard is that the treasures are so diverse, with objects from China, India, and Greece all mixed together. The jewelry is elaborate, set with precious stones of all colors. Since the treasure was uncovered in the late '70s, it’s changed hands a number of times, especially when Afghanistan was invaded and the national museum, where the collection was kept, was looted in the Afghan-Russian war a few years later. It has since been recovered and is displayed at museums all around the world.